PLMSCell-AT human adipose tissue-derived Mesenchymal Stem Cells (MSCs) are isolated out of adipose tissue and cryopreserved in passage 1. PLMSCell-AT cell number counts >5 × 105 cells/vial. After arrival they need to be stored in liquid nitrogen. PLMSCell-AT is characterised by several surface markers: (present) CD73, CD90, CD105, (absent) CD31, CD34, CD45 by Flow Cytometry) and the ability to differentiate into adipocytes, chondrocytes and osteocytes. PLMSCell-AT is negative for HIV-1, HBV, HCV, bacteria, yeast, fungi and mycoplasma, the seeding density is 2-4 × 103 cells/cm2. PLMSCell-AT is for research use only, not for clinical, diagnostic or therapeutic procedures. 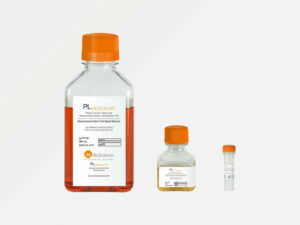 PLMSCell-AT is also available as a xeno-free product isolated under GMP conditions. PLMSCell-AT is optimally supplemented by our human Platelet Lysates, e.g. PLSOLUTION.